We’re all together again for a big shoot. Remember the Handicrafts Made Simple title card that I shared earlier? We’re shooting the next two DVDs in the series. So far, we’ve shot four sessions for the first DVD and things are going splendidly. Why? We have a secret weapon! And then we just had to share this photo. 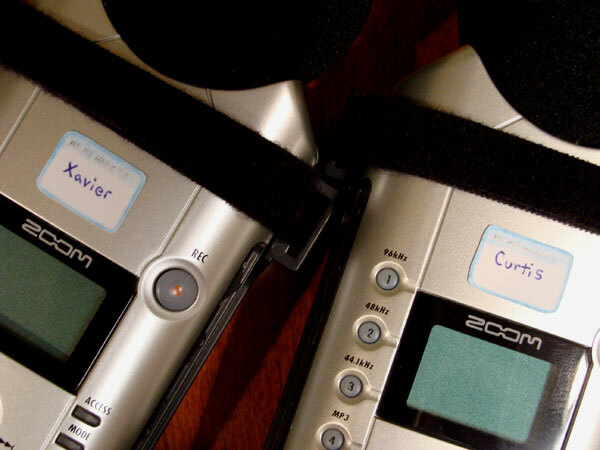 You see, Ruth and I have exactly the same Zoom H4 recorder. We’re using both for this project, so Ruth made name tags for them. I think they’re adorable! That’s all for now, though we might have more set photos later. Stay tuned! This entry was posted in Blog, Silliness and tagged Handicrafts Made Simple, name tags, set photos, shooting, teleprompter. Bookmark the permalink. We’ve named quite a bit of our equipment, actually. But the mikes are the only ones with tags. Zowie, what a nifty teleprompter. This remindeth me of an incident: Whilst filming our latest movie, there was a certain scene in which some of our actors were forgetting their lines, so we had them read the script from an off-screen laptop. In one shot, one person fac’d the camera and read lines from the laptop, which was surreptitiously held by the other person, who was fac’d away from the camera. We’ve previously done some videos where we printed the script on huge-lettered cue cards. But that brings with it all the problems of holding of the cards, changing them without making noise, and getting them where it looks like the talent is talking to the camera. 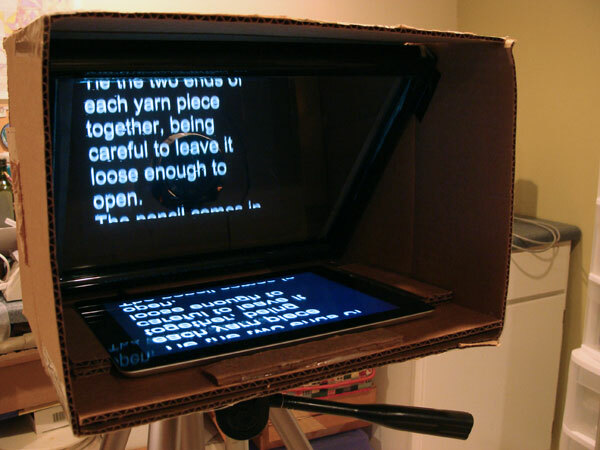 This teleprompter makes all the difference!